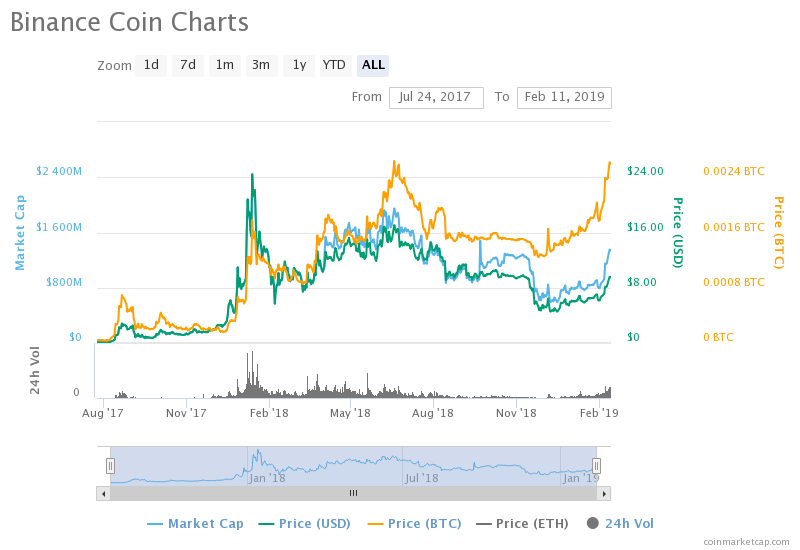 Binance Coin (BNB), the token issued by the world’s largest cryptocurrency exchange by trade volume Binance, has extended its recent gains to set a new all-time high in bitcoin-denominated value. At press time, BNB is trading at 0.002619 BTC ($9.60) but previously reached 0.002688 at 10:00 UTC Monday – the cryptocurrency’s highest price in its entire one and half year history, according to data from Binance. Binance first listed BNB for trading on July 14, 2017, and the token has achieved a nearly 9,600 percent return on investment from its December 2017 initial coin offering (ICO) price of $0.10. At the same time, BNB still has a ways to go before approaching it’s all-time high in USD value. Current figures represent a decline of 58 percent from BNB’s USD high of $22.48 achieved on Jan. 12, 2018, data from OnchainFX further reveals. BNB’s BTC-tied high came after a period of strong performance that played out over the past several weeks. As can be seen in the table below, BNB has significantly outperformed the market leader and world’s largest cryptocurrency bitcoin over the past 90-days, including a 35 percent increase in the past seven days alone when bitcoin rose just 5 percent. BNB’s recent growth has catapulted it to become the world’s 10th largest cryptocurrency by market capitalization, which now registers $1.33 billion, according to data from Coinmarketcap.com. While BNB may be the only well-known cryptocurrency to hit a new record of sorts, it has not been the best performer. Data from OnchainFX reveals three cryptocurrencies have outshined BNB in the past seven days including ARK, Dentacoin, and Theta Token who have printed gains of 35 percent, 43 percent and 43 percent, respectively, against the US dollar.